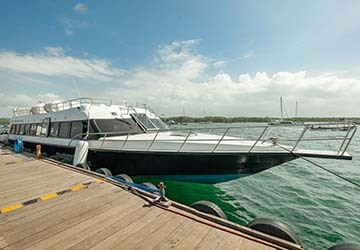 The Nusa Lembongan Gili Air ferry route connects Indonesia with Gili Islands and is currently operated by 3 ferry companies. Bluewater Express operate their crossing up to 7 times per week, Scoot Fast Cruises 7 times per week & the Gili Getaway service is available up to 7 times per week. There are a combined 21 sailings available per week on the Nusa Lembongan Gili Air crossing between Indonesia and Gili Islands and with 3 ferry companies on offer it is advisable to compare all to make sure you get the best fare at the time that you want to travel.